How Does Ultrasonic Cleaning Work? What Can You Clean with Ultrasonics? What Tools Do You Need to Clean with Ultrasonics? Sound is a power thing; it allows people to do everything from sharing information to singing songs. 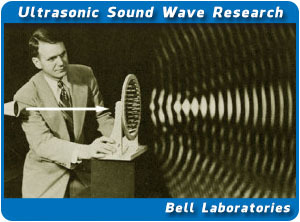 It is the science of sound (acoustics) that measures and controls sound waves. Ultrasonics is simply the application of sound waves to the cleaning process. Morantz Ultrasonic Cleaning Systems use the unique properties of sound waves to make cleaning with sound possible. Morantz Ultrasonics controls the sound and focuses it on dirty and contaminated areas of an object in order to clean it. It is the unique precision, and of course the power, of Morantz Ultrasonic systems that makes Ultrasonic Cleaning the fastest, most effective, most efficient and effortless cleaning method available. We should know; we’ve been building Ultrasonic Cleaning Systems for over thirty of our seventy-five+ years in business. The amazing efficiency of Ultrasonic Cleaning makes it an extremely popular and effective solution for a wide variety of applications. To demonstrate this efficiency, let’s look at two industries where Ultrasonics have been used with tremendous success; Window Blind Cleaning and Contents Restoration. When used in Window Blind Cleaning, Ultrasonics can typically clean an entire blind, including the headrail, cords and ladders, in 15 to 30 seconds (most other items can be cleaned in about 30-60 seconds). Not only does Ultrasonics restore the luster to window blinds, but by cleaning the headrail, it adds years of life to those blinds and eliminates replacement costs for your customers. Additionally, many blinds can be cleaned simultaneously allowing you and your team to complete large jobs very quickly saving you money. When used in Fire Restoration, items that are completely covered in thick soot can typically be cleaned in about 5 to 15 seconds, and this is accomplished without tedious hand wiping or using expensive and dangerous chemicals. The ultrasonic sound waves produced by our machines penetrates even smallest groove, crevice and detail of an object and gently lifts away soot and other contaminants. Use this form to Request Information, Request a Free Demonstration and Signup for our Free Newsletter. If you have a specific question Click Here or Call 215.969.0266. 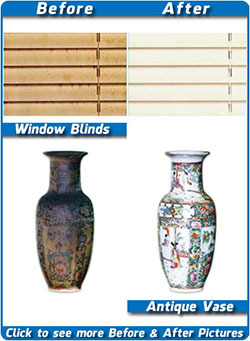 Window Blinds=Big Business Around the World!